At this time last year, I wrote a profile of the 3 groups that the Untied States and Canada’s World Championships delegation could be divided into. We had the Top 16 in one frame, those that came up just short in another, and then those who “merely” acquired a Day 1 invitation to the year’s coronation. We saw that the latter group relied more on League Cups, and that the foremost made a living on International Championships, among other trends. This year, a lot has changed, and while those two trends remain the same, the lines in the playerbase aren’t quite as clear. It would be difficult to consider our highly-unlucky 17th, Jose Marrero, with any of the players at 400 CP—and arguably, even those clinging around the Top 25! This year saw more separation in CP than we’ve ever seen before. So, in my efforts to write a sequel, we have 3 new divisions to consider this year: “The Top 16 Chasers,” the “Comfortable Invitees,” and “The 400 Club.” As we’ll see later, the latter two can blend together a bit, but there are some distinctions yet to be drawn. Still true—especially that blowing up part, though my next article is actually about why they should blow it up and how they could do it. Here’s my best shot at insight into the commitment required to be at the World Championships level of the game. The fundamental truth today, which I think this data does a decent job demonstrating, is that people need to remember we are playing by TPCi’s definition of “top.” This is true of both Days of Worlds invitations. 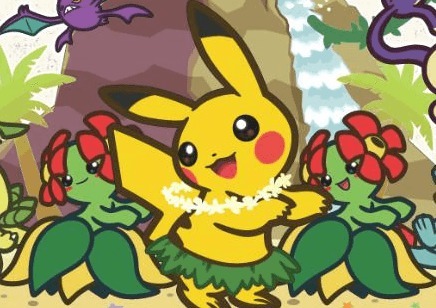 It’s not the fault of anyone who played according to the rulebook TPCi has set that they earned “too many points” at “easier tournaments,” or anything to that effect. Take issue with the rules all day long—but don’t take issue with those who played the system to take advantage of them. Unfortunately, the rest of the world (and the younger world) is data I just don’t have. I promise it’s not that I only “care” about NA Masters—it’s just that they’re the only people for which I have information to work with! This year started off with a few interesting announcements: a relatively low CP bar for Day 1 (compared to historical barometers) and the removal of the best finish limit for Regional Championships. With the low bar came a new set of incentives for chasing the Day 2 bye, which I’ve blogged about, and a new set of players who saw their first Day 1 invite on the horizon. The removal of the best finish limit only created a perception that Day 2 would be harder, which set this race up to be even crazier than last year. I’ve argued extensively that reinstating a Best Finish Limit would actually achieve nothing positive for anyone, but that would be inversely true at the upper tier of Top 16. The way the season worked out, those at the top tier were able to take June mostly off, while those of us in the 19-12ish range worked the Mexico grind. As you can see, the International Championships were a huge part of all of these players’ runs—in many cases, the deciding factors. Unlike some of what we’ll see later, Cups were a smaller chunk for many of these players, but Regionals were largely high-performance venues (well…myself aside). All things you would expect of a “top” 16, but it cannot be underscored enough that you cannot practically Top 16 without some level of International involvement. On average, these 19 earned 54% of their CP at Regionals/Specials, 26% at Internationals, and 20% at League Cups. By “average,” I took each player’s distribution and took a mean across the statistic: looking at the sum of points in total (so, the 33000ish points all of us combined to earn), it would be a 55/19/26% distribution). The average number of ICs attended is a bad statistic: the important thing you need to know with this group is that 15/19 attended all 4, and nobody attended less than 3. Unsurprisingly, Oceania was the most-skipped, which continues to emphasize my point that Oceania is the best way to boost your Top 16 chances with the way the structure has generally been constructed. When combining international and domestic alike, the average person in this group attended 14.37 Regionals and Special Events, and achieved finishes at 12.37 of them. That’s a whopping 86.1% rate of finishes, meaning people only missed points 13.9% of the time as a group. Or, maybe, a better title would reference the relative irrelevance of Regionals. Here are the year’s top performers at the US/Canada’s 15 Regionals, with the Top 16 finishers in blue. Some folks who had reputably strong seasons, like Alex Hill, show up far more highly on this list: they were missing the International accomplishments to put themselves in the Top 16, at least as Pokémon has defined it. The same is true of Xander Pero’s proximity to Top 4 on this list: an outstanding Regionals run, but missing the Internationals support to bolster his CP total. And then there are those of us on the other side of that. As you can see, I was a model for terribleness in Regional performance this year: I came only 30 points shy of my season total for North American Regionals in just 3 June weekends spent abroad. But, I had a healthy supply of Internationals points from going 3/3 outside of North America, and therefore landed in Top 16 fairly comfortably. In fact, as a quick highlight to the absurdity of the NA16 race this year: if you took away NA Regionals CP and League Cup CP, leaving only International Championships and out-of-zone SPEs/Regionals, Jimmy Pendarvis, Joey Ruettiger, and I would qualify for Day 2 in Europe and Oceania. If you kept League Cup CP, we could break Latin America’s Top 8 too. That’s not a dig at anywhere else, because other regions have some players that could say the same of North America, but more an illustration that maybe Top 16 is a bit low for the largest playerbase on earth. That’s a discussion for another day. Backing up to the initial point, though: this list demonstrates that, outside of a few of us, Regionals were not what decided the Top 16. That falls to Internationals. Many players argue this is improper, that Regionals should have a greater emphasis, or any other number of things. My perspective: as long as TPCi is running the Internationals as the pinnacle of the circuit, their emphasis will not be reduced. From the perspective of running an organized play circuit, it makes sense to reward those that perform the best on an international stage when it comes to seeding the World Championships. We see that Internationals are currently deciding the Day 2 invitee pool. Personally, I haven’t seen a compelling reason to move away from that emphasis, but as with all of this, there’s important perspective to be kept in mind: we’re finding the 16 best players at the structure TPCi has outlined, not the straight 16 best players. TPCi’s gauntlet demands one prove themselves to be a part of the best repeatedly: either frequently at the top levels or highly, highly frequently at the lesser tiers. Take Xander Pero and I’s seasons in juxtaposition. He won 2 Regionals, but did not do well on the Internationals circuit. Meanwhile, I earned more than 60% of my Championship Points off American soil, headlined by a Top 4 at EUIC. We finished 4 CP apart. I think almost every American would view his season as superior to mine—and I’m not saying they shouldn’t. I do think a majority of the playerbase suffers from an internalized, somewhat-dull notion that North American Regionals are the creme-de-le-creme of the tournament series and should be rewarded as such, though. To a degree, yes, they’re the largest tournaments on earth: but remember that TPCi’s system does not necessarily reward that, and when trying to suggest alternatives to TPCi’s current system, remember that TPCi’s system needs to work for more than just North America. This is rich content coming from me and my recent Regionals record, I know. But, for anyone considering a chase next year, be prepared to lose the concept that North American Regionals will reward you. Unless you’re going to go on a prolific run equivalent to Azul, Igor, or Michael’s, you’re going to need a different perspective. As some added bonus content: if we stripped League Cups from Top 16, nothing would change. I cannot scream it any more loudly than I already have, but League Cups are an empty waste of weekends for players chasing the top of the NA circuit. It’s a bit different in other regions where there are less events, but if we could see our way to a world with less emphasis on them for the Top 16 crowd, I know it’d be greatly appreciated by many. I think the lost attendance of ~20 people nationwide would be way smaller than it sounds, given I know some of this year’s NA16 are going to qualify as lost attendance when they show up to less as a result of burnout anyway. Given they’re not having a sizable competitive impact, I would argue for their removal from these rankings’ consideration. 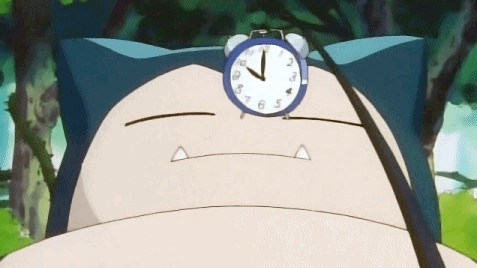 But, that’s likely dreaming. Most of these players for most of the year. Amusingly, the group managed to earn 50% of its CP at Regionals, 33% at Cups, and 17% at ICs—and that’s whether you average each player’s stats or the total sum of CP. So, in essence, we see an increase in players’ Cup compositions, but as I alluded to in the secondary section of the Top 16 profile, many of these players did just as well (read: better than me) at NA Regionals as the Top 16 crowd. This isn’t just because they have less CP, emphasizing the Cups more by a matter of math: on average, they only earned 254 CP from Cups, compared to 317 by the average Top 16 chaser. 12 of these players attended only NAIC, 8 attended at least one another, and a pair of players attended 3 of the ICs, for an average of 1.55 per player. It was easily achievable to finish in this region without International travel, but it wasn’t harmful either. On average, this group attended 8.68 Regionals/Specials and got points at 6.45—a very solid 74%, which, personally, was higher than I initially expected. This tells me that this is a group of players that largely could’ve competed for Top 16 on a skills basis, but merely did not attend enough events to prove that. Arguably, I invalidate my own argument there: by failing to attend enough events to prove their skill, there’s a case to be made that these players could’ve been “lucky” and not really as good as those that were among them. That’s not saying it’s a good argument, just that it’s one that could be made: and inevitably, I guarantee a system that rewarded such runs over the season-long chase would garner at least one argument to this effect. I bring this up to make this point: no system is ever going to be free of someone who “gamed” or “got lucky”—Pokémon isn’t a game where we’re ever going to reliably sit the best X players on a given day by any metric. In my opinion, one of the biggest issues of disincentive present in the current structure exists for the player who earns 400 CP fairly early in the season, but either barely misses the 2nd IC Stipend cutoff or otherwise doesn’t have the means to chase the Top 16 craze. Such a player, under the current system, has no reason to participate in the rest of the season beyond Regionals’ cash prizing, which is not a terribly good investment under most circumstances. Especially with the local scene, which I would argue is in far more dire straits than most seem to realize, this player has no reason to support local stores’ League events. There are a few ways to work around this, but I just want to touch on two big ones. The first involves tinkering with the Worlds structure, perhaps adding Day 1 byes for a segment of players or otherwise finding a way to have a softer tradeoff between Top 16’s total pass and 17th’s total heartbreak. This would double as a way to increase play incentive across the board and a way to soften the sharpness of 17th-19th’s heartbreak this year—while someone eventually has to be the difference between something and nothing, I think it’d be in TPCi’s better interest that the someone in question not be a 100 Play! Point ringer who dedicated a year to the game only to lose out by 8 Points. There’s a difference between “everyone’s a winner!” and smart decisions to increase player satisfaction with the product at minimal extra cost. Extra Byes for Worlds Day 1 would strike the median, in my view. The other option is some sort of rewards scheme that offers certain CP tier players unique rewards, such as sleeves, promos, or other goodies. This is a much softer incentive, but only costs TPCi material and management cost rather than immaterial benefits at an event whose consequences are harder to gauge at the beginning of the year. This takes its inspiration from the Player Rewards program of the past (where players got things just for playing), but is further emboldened by Japan’s similar structure from this season, which was CP-based, but had a similar concept. Now, Japan did roll back its version of the system for the 2019 Championship Series, implying they maybe found it a bit of a headache to handle—and Player Rewards were notorious for being so many years late that people weren’t always sure what year each shipment was for. So, the magic formula is probably not located in this vicinity, but I think it’s a cool idea that an ideal world would see as beneficial to players in a number of ways. Also featuring the 599 CP Club, these folks earned an invite to a bit less than an invite and a half. Once more, we see a number of stories when we look through this list, from promising first year players that look to figure into bigger conversations next year, to content creators taking a solid step, to old veterans who chose to dedicate relatively minimal time to the series but still ensure they had a shot at the big crown at the end of August. One of the beautiful things about the current system is that latter group. For all the criticism about the “best” being diluted at Worlds by those “less worthy,” I think a lot misses the boat by failing to consider the greats of the game who we’ll see at Worlds only as a function of having this “easier” invite around. Ross Cawthon and Frank Diaz are only two of the players that fall into this group off the top of my head, and nobody would disagree that they are more than Worlds calibre. They’re currently in the same boat as the first years that I mentioned: they’ll be able to prove their skill on Day 1, and with 6 or 7 well-played Rounds, move onto the same footing as those who spent all year doggedly avoiding that Day 1. As the structure is currently comprised, there are two routes players can take to being in the year’s final field. Most directly, they can prove their worth as one of the world’s very best by battling it out all year and grabbing a Day 2 slot from their region. Alternatively, if one is truly good enough to “merit” that Day 2 inclusion as a function of any structure, that route is there for them: prove continuing competency through the Day 1 invite, then prove that “very best” tier by navigating Day 1 of Worlds. Now, of course, Day 1 of Worlds is no picnic and many great players will fail to make it through this year: the system does not work in every case with 100% reliability. But, I do think this system is actually fairly genius for the balance it strikes in meeting the needs of so many different players. For the equipped and skilled, there is a Day 2 bye to pursue. For the skilled, but not the equipped, Day 1 is your way to make up the difference. For the person not ready to jump into the Day 2 chase, but looking for a shot at the top, the Day 1 invite awaits. The biggest flaws, in my view: some slight imbalance in Day 2 invite allocation and the sharp drop-off between Day 2 and Day 1. Is it a different World Championship than we played through 2014? Absolutely. Is that a bad thing? I haven’t seen a persuading case to date. 9% of this group’s CP came from International Championships. 36% from Regionals/Specials. The mathematically inclined have already worked out that this means League Cups made up 55% of this range’s CP total . The average player in this range earned 247 Cup CP, so not as many as either of the other groups, but obviously it was a healthy portion of many invites. 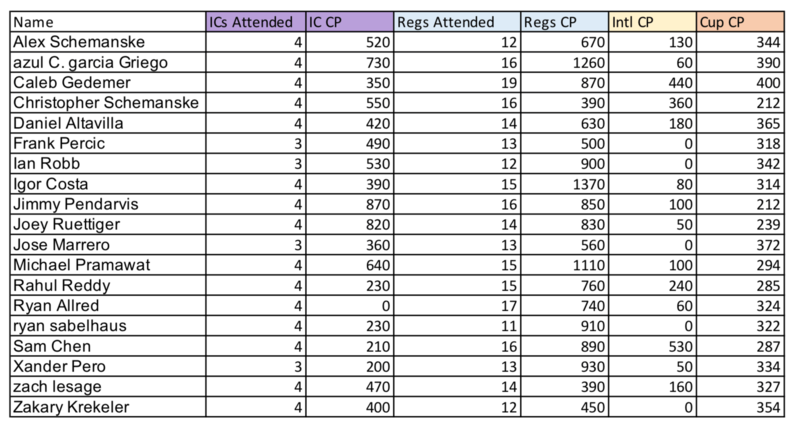 177 attended only NAIC, 21 attended a 2nd IC (mostly Europe), and a lone ranger attended 3 of the 4. What caught my eye: 78, or 28%, didn’t even attend NAIC. While Internationals are key to the Top 16 chase, it’s more than possible to earn a Day 1 invitation without even attending the big show. On average, we saw an average Regionals attendance of 5.38 and finishes at an average of 3.28 of them. 61% of the time, this tier of player walked away from an attended Regional with Championship Points. What blows my mind here: in attending 5.38 Regionals, this means the average player just earning a Worlds invite is in the 95th percentile for attendance. 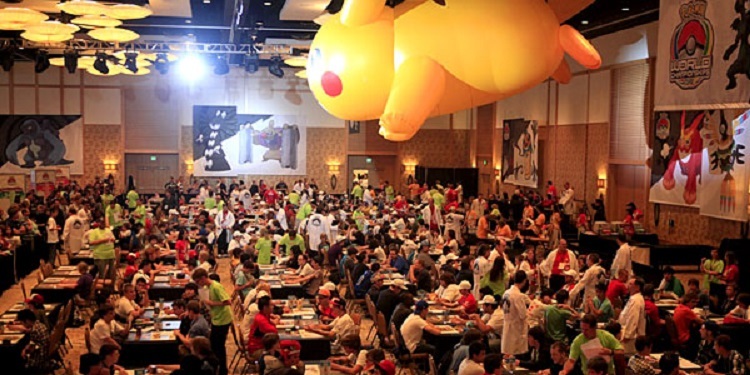 The average 400-599 CPer attended more Regionals than 95% of the players who attended at least 1. I think that’s powerful perspective and insight into how little Worlds as a carrot seems to actually matter to the size of events. As for the “someone can earn an invite on League Cups!” argument, I regret to inform it is useful in theory only. Caleb Gedemer is the only North American player I can find to have gone 400/400 on League Cups this season, and since you can find him comfortably in Top 4, I think that one ought to go to bed now. I hope you found this interesting, learned something, or have had your curiosity piqued in some way. At this point, I write for the sake of trying to lend as much perspective on the structure as I possibly can, and I hope I achieved some element of that today. With this in the books, I think I can officially put a wrap on the 2017/18 season as it goes for us on SixPrizes. Should someone point out something I’ve forgotten to write, that could change, but otherwise, I want to thank you for reading and for whatever degree of support you had for us this year. From here, we look toward Worlds and the 2019 Championship Series beyond. I don’t think that will change as we move into next year, and I’d encourage everyone to weigh their goals as we head into the beyond with that in mind. Remember that “best” is not necessarily absolute. Take care not to assign self-worth to things you cannot control. Being number 2 is not the end of the world.